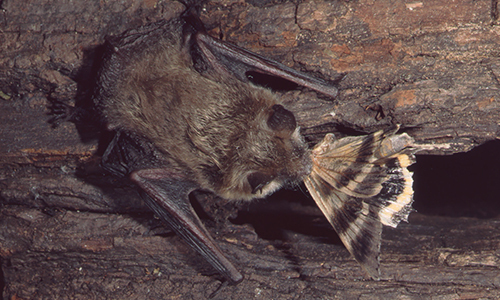 Most bats eat insects, but there are also species that eat fruit, nectar, fish, and other vertebrates. 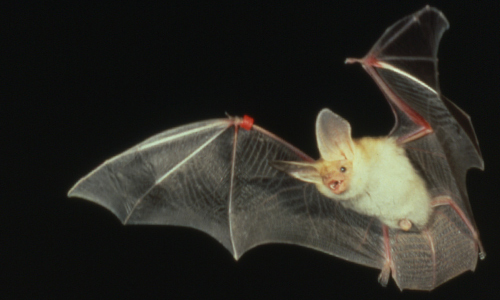 Three species of bat drink blood, none of which are found in Canada. 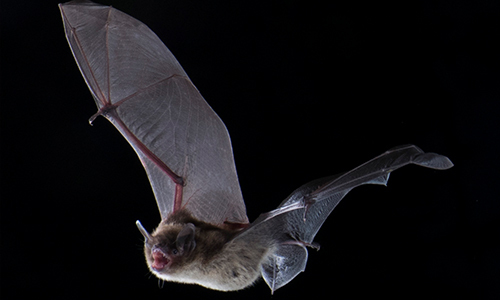 As the primary predator of night flying insects such as moths, beetles, and mosquitoes — Canadian bats can catch hundreds of insects in just one hour. In fact, bats typically consume between 30 to 50 per cent of their body weight in insects in a single night; a pregnant female can consume 100% of her body weight each night. Having a healthy colony of bats can protect gardens and crops from damage and pests. Bats make up nearly a quarter of known mammal species and are second only to rodents in terms of diversity. And there may be even more out there! Bat species are still being discovered. In fact, we are currently at 1300+ and counting! Most of this diversity in bats is found in the tropics. Bats have a wide distribution and can be found on every continent except Antarctica. Moreover, bats come in all shapes and sizes.The golden-crowned flying fox (Acerodon jubatus) with a wingspan of 1.5 metres. The smallest bat is the Bumblebee Bat (Craseonycteris thonglongyai) which weighs around two grams with a wingspan of ~170 milimetres. Bats evolved between 54.8 and 65million years ago and are more closely related to people than rodents. North America has 48 bat species, with 19 found in Canada. 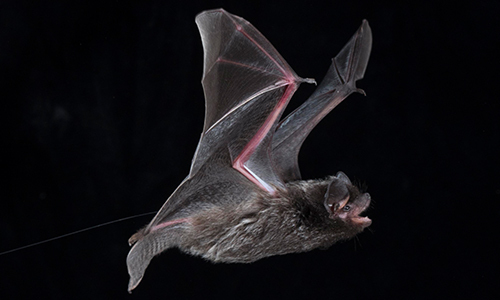 British Columbia has the greatest diversity of bats (16 species) among the provinces; eight of those species do not occur anywhere else in Canada. All bats found in Canada are fairly small. 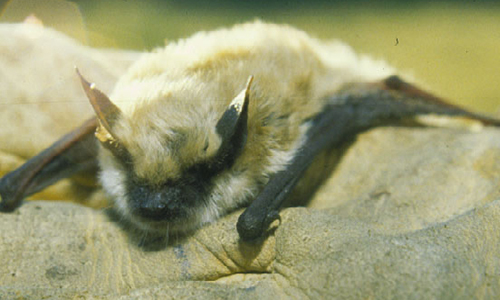 The biggest bat in Canada is the Hoary Bat (Lasiurus cinereus) which weighs 26 grams with a 40 centimetre wingspan. 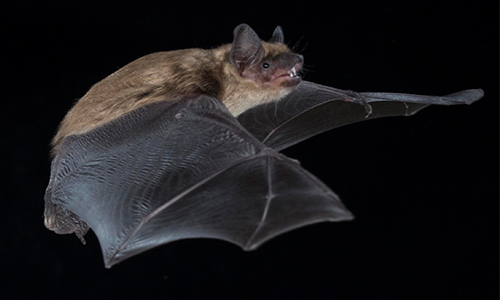 The smallest bat in Canada is the Tricolored Bat (Perimyotis subflavus) which weighs between four and 10 grams with a wingspan of 21 to 26 centimetres. 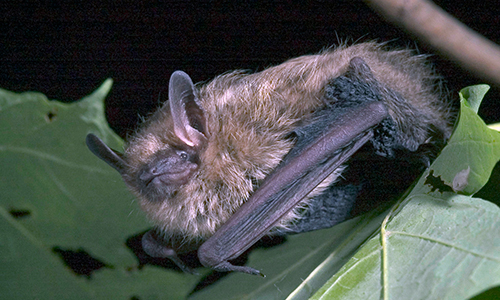 Bats consume a variety of insects, some of which are important agricultural and forestry pests. In other areas of the world bats are also important for seed dispersal and pollination. 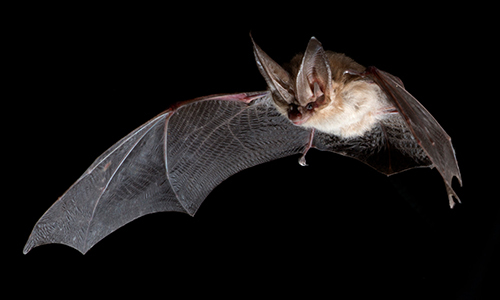 In the U.S. alone, it is estimated that bats provide insect control services worth a few billion per year. "Blind as a bat" is an expression based on the myth that bats are blind. In fact, bats have great vision and rely on it for many aspects of their lives. 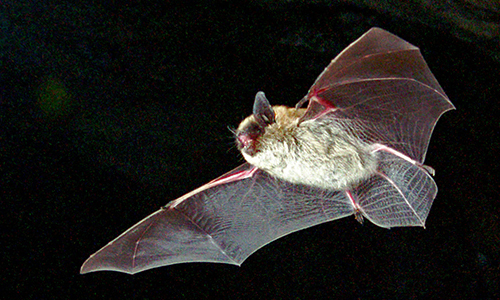 To find prey, however, most bats rely on echolocation. Bats, like dolphins, use high-frequency sounds to navigate and communicate. 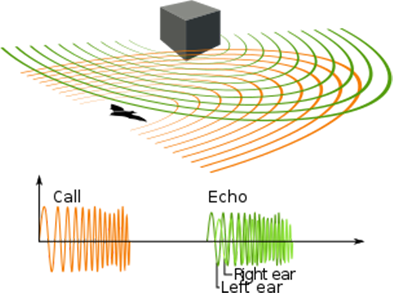 Bats send out pulses of sound and the returning echoes enable them to detect obstacles in their path. Their skill is such that they are able to avoid items as fine as a human hair. So much for the myth that bats get caught in human hair! 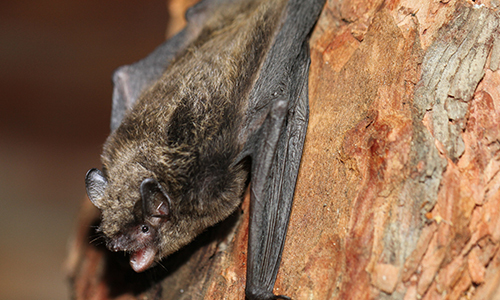 Learn more in this comprehensive list of Canada's bats. The Big Brown Bat (Eptesicus fuscus) is a common species found in most of southern Canada, hibernating in caves, mines and buildings. Their length is 11 to 13 centimetres with a wingspan of 32 to 40 cm. Their colour varies from tan to dark brown. Females form maternity roosts in buildings (such as attics and barns), bridges, bat houses, but also in loose tree bark, tree cavities and rock crevices. Through March and April and stay until late summer and early fall. The females have a gestation period of 60 days (around two months) before giving birth to one or two pups in May through June. California Myotis (Myotis californicus) is a common species found in B.C., hibernating in buildings, mines, caves and dead trees. They are seven to 10 cm in length with a wingspan of 22 to 26 cm. Their colour varies from reddish-brown to dark brown. In early spring females form maternity colonies in summer roosts. These roosts can include crevices found in rocks and trees, caves, tree cavities, mines, buildings, bridges, shrubs and bat houses. They leave these colonies and mate in late fall where the females undergo delayed fertilization in which they store sperm through the winter and ovulate, and thus become pregnant in the spring. The gestation period for this species is unknown but females birth one pup in May to early June. Tricoloured Bat (Perimyotis subflavus) is an endangered species found in Ontario, Quebec, New Brunswick and Nova Scotia. They are seven to nine cm in length with a wingspan of 21 to 26 cm. The colouration of each hair is black at the root, then yellow, with brown tips. It mates in the fall and then spends most of the year in hibernation anywhere from six to nine months. Roosting in buildings and large trees. Females have a gestation period of 44 to 60 days where they birth one to two pups in June. 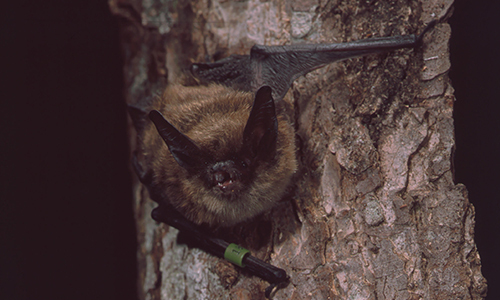 Eastern Small-footed Bat (Myotis leibii) is identified as a species of Least Concern and found in southeastern Ontario and southwestern Quebec. They are seven to nine cm in length with a wingspan of 21 to 25 cm. This species of hibernating bat can be found in hilly, mountainous areas, deciduous or evergreen forests and open farmlands. They are golden-brown in colour. Roosting in spring and summer in hollow trees and under loose tree bark and rock crevices. They have a six to nine week gestation period eventually giving birth to one pup between May and July. They leave the roosting sites to mate in late summer to early fall and then hibernate in the winter in caves and mines undergoing delayed fertilization. Fringed Bat (Myotis thysanodes) is a species of Special Concern and can be found in British Columbia. They are eight to 10 cm in length with a wingspan 27 to 32 cm. Named after its stiff or ‘fringed’ hair, it has pale brown fur, with dark brown ears. When they’re not migrating, they typically roost in mines, cliffs, forested areas and buildings. They have a gestation period of 50 to 60 days and give birth to one pup in June or July. Hoary Bat (Lasiurus cinereus) is a common species found in nine of the provinces and territories including: British Columbia, Alberta, Saskatchewan, Manitoba, Ontario, Quebec, New Brunswick, Nova Scotia and Northwest Territories. Hoary Bats roost in hedgerows, trees and other vegetation. This migrating species of bat can be found in coniferous forests. 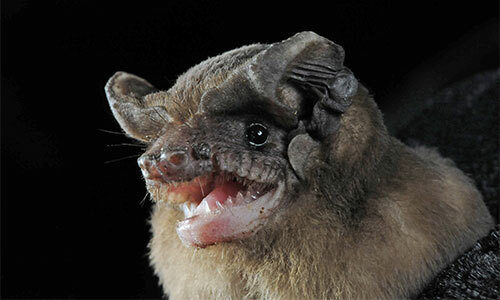 It is the largest bat known to Canada with a length of 13 to 15 cm and a wingspan of 36 to 41 cm. Its colouration is black with brown-grey fur, frosted white tips on its back and tail, and a yellow head and throat. These bats mate in late summer and in the fall in preparation to their autumn migration. Some hibernate in the winter while others migrate south. The females store the male’s sperm throughout winter before fertilization in the spring. They birth one to four pups in mid-May to late-June after a gestation period of 40 to 56 days. 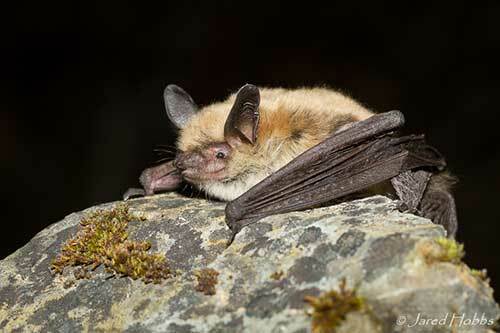 Keen’s Myotis (Myotis keenii) is a common bat species found in British Columbia. Their wingspan is 21 to 26 cm and they are seven to nine cm in length and they have silky brown fur. The females of Keen’s Myotis form maternity colonies after the bats leave hibernation in May and leave them in mid to late August. After which, both species swarm and mate in caves in September and hibernate in October. The females undergo delayed fertilization and have a gestation of 40 to 60 days after fertilization. A single pup is born in early June to late July in the maternity roost. This roosting can be a cool, wet, coastal montane forest, a cave, loose bark, rock crevices and even buildings. 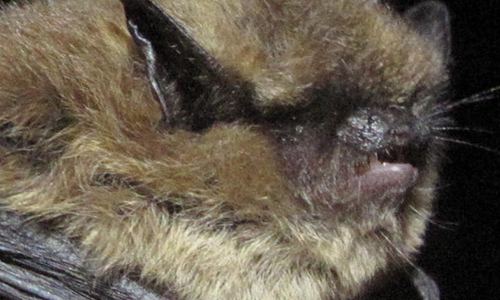 The Little Brown Myotis (Myotis lucifugus) is an endangered species despite being identified in all parts of Canada. 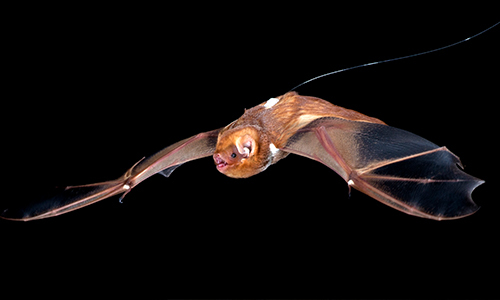 Like its name, this species of bat is only six to 10 cm in length and has a wingspan of 22 to 27 cm. It is brown in colour. It hibernates in dead trees, cliffs, mines, caves, and buildings. The females form maternity roosts in buildings, tree cavities and bat houses. The females store the sperm over winter and fertilize in spring. They are pregnant for 50 to 60 days and give birth to one pup in June or July. Western Long-eared Myotis (Myotis evotis) ) is a common species of bat found in British Columbia, Alberta and Saskatchewan. It has a length of eight to 10 cm and a wingspan of 25 to 30 cm. It is pale brown in colour with a black face and ears. This species mates in the fall through early winter and the females experience delayed fertilization. After emerging from hibernation, the females form maternity colonies in the summer in trees, stumps/snags, caves, and rock crevices. They gestate for 40 to 60 days and birth one pup. Long-legged Myotis (Myotis volans) ) is a common species of bat in British Columbia and Alberta. It has a length of eight to 10 cm and a wingspan of 22 to 30 cm. It is typically dark brown in colour. When it isn’t migrating short distances, it can be found in mines, caves, and dead trees. The females store the sperm over winter and gestate for 50 to 60 days when they emerge and form maternity roosts. Inside buildings, rock crevices and trees, the females birth one pup in June or July. 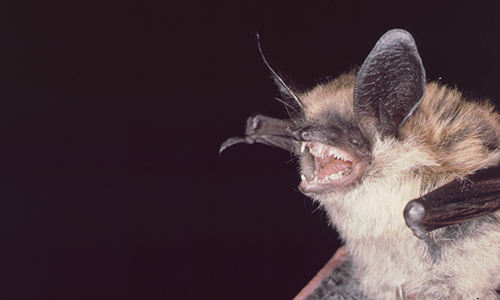 Northern Long-eared Myotis (Myotis septentrionalis) is an endangered species and can be found in British Columbia, Alberta, Saskatchewan, Ontario, Quebec, Nova Scotia, Prince Edward Island and New Brunswick. Its length is seven to 10 cm with a wingspan of 22 to 27 cm. It has large black ears and a yellow-brown body. After the hibernation period of October to mid-May, the bats emerge, and the females form maternity roosts from May to mid-June. During this period, they gestate for 50 to 60 days and birth one pup around June. They roost in tight crevices and holes, trees, caves and buildings. Pallid Bat (Antrozous pallidus) ) is a Threatened species of bat that in Canada can only found in the Okanagan Valley of British Columbia. It has a length of six to nine cm and a wingspan of 35 to 41 cm. It has a pale stomach, brown back, grey wings and a snout-like nose. The Pallid Bat breeds in October throughout winter hibernation. Emergence of these bats changes every season. The bats hibernate in buildings and caves. They roost in caves, rock crevices, mines, hollow trees and buildings. The females birth one to three pups in late spring (May or June) after a gestation period of 53 to 71 days. Eastern Red Bat (Lasiurus borealis) is a common species that can be found in British Columbia, Alberta, Saskatchewan, Manitoba, Ontario, Quebec, New Brunswick and Nova Scotia. Its length is nine to 12 cm and has a wingspan of 28 to 33 cm. It is multi-coloured with yellow-red-orange and yellow-greyish fur. When it isn’t migrating to warmer regions in the winter, they can be found in deciduous forests. The females find maternity roosts in trees or shrubs at this time where they stay until mating season again. For the pregnant females, they gestate for 80 to 90 days and eventually give birth to one to four pups, in late May through early June. This is primarily due to the Eastern Red Bat having four mammary glands instead of the usual two. Silver-haired Bat (Lasionycteris noctivagans) is a common species of bat found throughout British Columbia, Alberta, Saskatchewan, Manitoba, Ontario, Quebec, New Brunswick and Nova Scotia. Its length ranges from nine to 11 cm and has a wingspan 27 to 31 cm. It is black-dark brown in colour, with frosted tips. It is a migratory species and roosts in mines, caves and dead trees. The bat emerges in the spring with the females forming maternity colonies during this time. The females store sperm over winter and in spring become fertilized and are pregnant for 50 to 60 days. They birth one to two pups around June and July. Roosting sites in the summer include tree hollows, behind loose bark, bird nests, buildings and caves. Spotted Bat (Euderma maculatum) is a species of Special Concern and in Canada can only be found in British Columbia, although it occasionally migrates. It can easily be identified by its three white spots on its black back and has the largest ears of any bat species in North America. Gestation is unknown as this species is very sporadic with spring emergence. The spring and summer roosts are usually found in small cracks in cliffs and rocks. The females birth one pup in June or July. It has a length of 11 to 12 cm and a wingspan of 34 to 38 cm. Townsends Big-eared Bat (Corynorhinus townsendii) is a species of Least Concern and can be found throughout British Columbia hibernating in mines, caves, buildings and cliffs. This species has a length of 10 cm and a wingspan of 29 to 34 cm. It is pale brown-black-grey in colour with two visible glandular swellings on its nose. 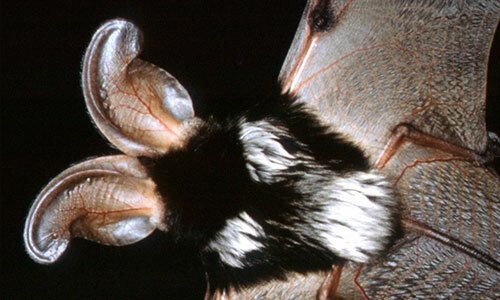 The Townsend’s big-eared bat hibernates September to May and mate during this hibernation in November through February. The maternity colonies form after emergence and break up in August. The roosts for these sites are caves, mines and buildings. The females gestate for 56 to 100 days and give birth in late June to mid-July to one pup. Western Small-footed Bat (Myotis ciliolabrum) is a common species found in British Columbia, Alberta and Saskatchewan. It is eight to 10 cm in length and has a wingspan of 21 to 25 cm. It is yellow-brown in colour with a black face. 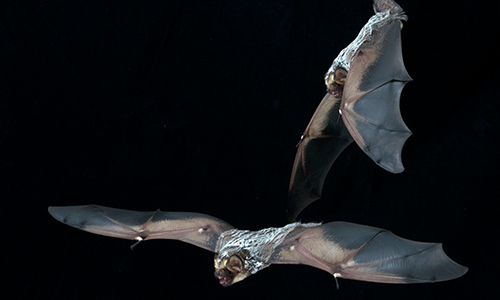 Pregnancy lasts around two months but very little is known about these bats. Only one pup is born mid-June to late July. They like to roost in caves and rock crevices, clay banks, buildings, bridges, mines and bat houses. It migrates throughout the winter season. Yuma Myotis (Myotis yumanensis)is a common species found in British Columbia, hibernating in buildings, dead trees and mines. Its length is eight to 10 cm and has a wingspan of 22 to 26 cm. It varies in colour from dark brown to tan-grey. The roosts this species enjoys are caves, buildings, mines and bat houses. The females roost together in April to late August or October, depending on the location. Their gestation period is unknown. Sometime in May or June, the females birth one pup. Brazilian, or Mexican, Free-tailed Bat (Tadarida brasiliensis) is a species of Least Concern only found in Canada on Salt Spring Island in British Columbia. They are eight to ten cm in length and have a wingspan of 28 cm. They are brown in colour with large square ears, a wrinkled upper lip, and a prominent tail. They can be found roosting in caves, bridges, attics, buildings, hollow trees and mines. 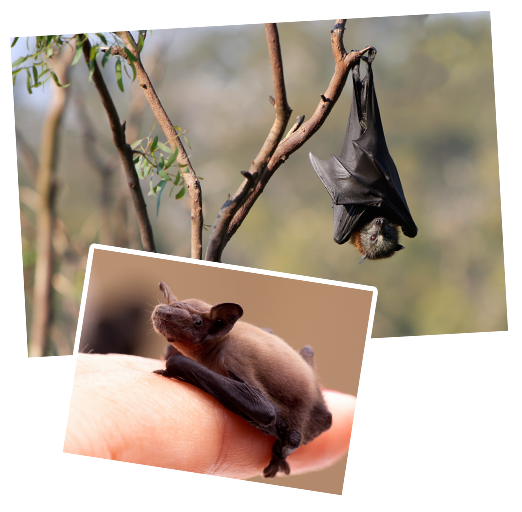 These bats mate in March and roost June to September before hibernating in the winter. The females birth one pup in mid to late June after a 90-day gestation period. When it comes to finding a companion, bats really go the distance. In early August, male bats peruse caves and mines searching out spots to spend the winter and mate with females. 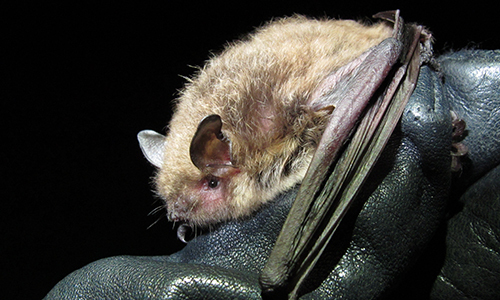 On their search, bats span tens and potentially hundreds of kilometres between overwintering spots. But what happens after the love fest is a bit of a mystery to researchers. We’ve assumed they settle in for hibernation, however, bat banding recoveries show that bats still migrate well into the fall — up to 60 kilometres a night — suggesting bats may hobnob at multiple hibernation sites when the temperature dips before choosing their final resting spot for winter.